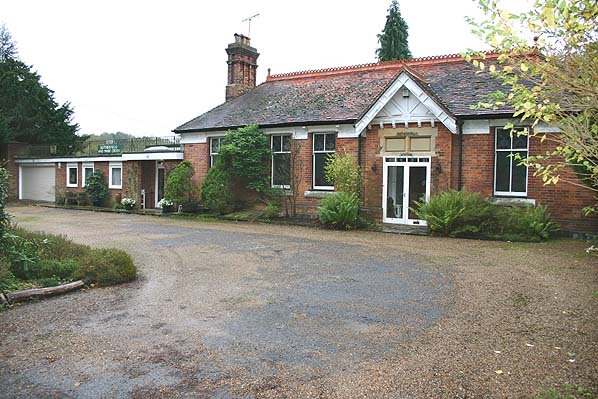 Present state: The main satiation building and station house have been converted into two separate residences. The platforms are largely gone with a swimming pool now built between them. The platform canopy on the main building has been retained and now forms the roof of a sun lounge. A sign from the signal box has now been erected above the former booking office. New housing has been built on the site of the goods yard and shed. The `Cuckoo Line' from Polegate to Eridge was completed in two stages. Initially a route from Polegate to Hailsham was opened on 14th May 1849 and a line south to Eastbourne opened to traffic on the same day. These lines followed only three years after a route had been completed east from Brighton via Lewes and Polegate to St. Leonards. The remainder of the route northwards from Hailsham to Eridge was completed some 31 years. In 1873, local business interests promoted a Bill for a 3' gauge line from Tunbridge Wells to Polegate. Little progress was made in raising the required capital and the LBSC stepped in, obtaining an Act in 1876 giving them authority to extend their Hailsham line to Eridge where it joined the Uckfield - Groombridge Junction line (opened in 1868). The South Eastern Railway was to be given a share in the receipts and running powers over the line into Eastbourne. The 7 1/2 miles of single track was opened between Hailsham and Heathfield on 5th April 1880 and the 9 3/4 miles on to Eridge on 1st September that year. At Redgate Junction, south of Eridge it joined the route from Uckfield to Groombridge and both lines ran in parallel to Tunbridge Wells and to London via the Oxted line. When the Uckfield line was doubled in 1894 the Heathfield line north of Redgate Junction became the down line. The name `Cuckoo' was adopted by the railwaymen themselves. This relates to the old Sussex legend that on the 14th April annually the first cuckoo of summer is released at Heathfield Fair. By 1904 services on the Brighton lines had assumed a pattern that was to remain radically unaltered until 1933. There were a total of 83 workings between Groombridge and Tunbridge Wells West where trains went on to three destinations, Three Bridges, Brighton via the Uckfield line and Eastbourne via the Cuckoo line. By 1925 the single track spur from Tunbridge Wells West to Central was little used with four daily trains to Brighton and two to Uckfield. Three of these carried through carriages for the Cuckoo line which were detached at Eridge. By the 1950's this had improved and in 1956, 58 passenger trains and two freights used the spur making it, for that year, the busiest section of single track in the country. 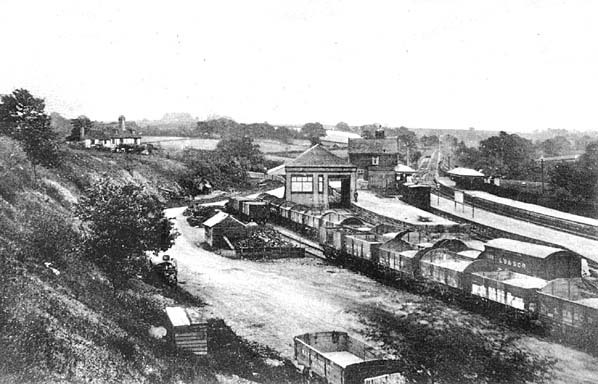 The main goods stations on the Cuckoo line were at Heathfield and Hailsham, the other stations handled little more than the occasional wagon of coal. Despite a new timetable being introduced in the 1950's with one train an hour on the Cuckoo line, it was not to survive the Beeching cuts. In 1965 a survey revealed that there were only 250 passengers a day using the line of which only 23 were season ticket holders. Any attempt to promote the line was halted under the Beeching plan and a new timetable was introduced with long waits between connecting trains designed to deter passengers from using the service. trains continued from Hailsham to Heathfield until 26th April 1968 when a bridge became damaged and repair was considered uneconomic and not carried out. Hailsham closed completely on 9th September 1968 and with this the final stretch of Cuckoo line had gone. 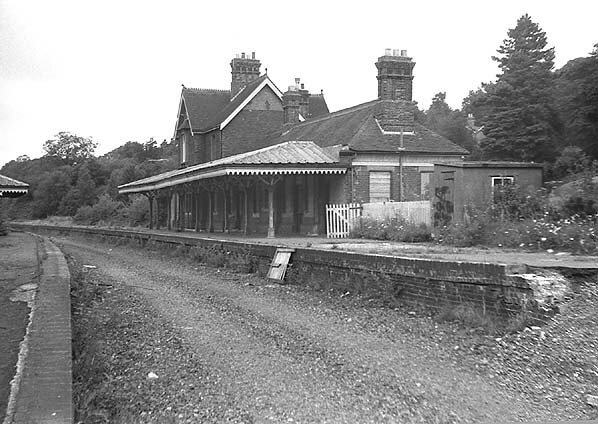 Although the line between Groombridge and Tunbridge Wells West was also proposed for closure this remained open but there was no future investment in the line and by the early 1980's the track and signaling needed replacing. With the planned removal of Grove Junction during the upgrade of the Tonbridge - Hastings line British Rail decided they could no longer justify keeping the line open and announced closure of the line from 16th May 1983. Once again there were strong objections but these were outweighed by British Rail's cost argument. They estimated that to upgrade the infrastructure, while retaining the existing services, would give a £175,000 loss per year and the Secretary of State confirmed closure of the line on 6th July 1985. Grove Junction was removed the day after closure but the line from Eridge to Tunbridge Wells remained in use until 10th August 1985 when the depot was closed. Shortly after closure the Tunbridge Wells and Eridge Railway Preservation Society was formed with an aim of reinstating the passenger service on the line. The Society acquired the line in the early 1990's and by winter 1996 they had refurbished half a mile of track and were able to run a steam service from their base on part of the old Tunbridge Wells West station site. TWERPS later merged with the North Downs Steam Railway at Dartford, Kent. The line is now known as The Spa Valley Railways, a name chosen as the result of a competition. The Spa Valley Railway now runs for 3 1/2 miles to a new station at Groombridge with an intermediate station at High Rocks built by the owner of the High Rocks Inn and Restaurant. Between 1992 - 1994 the section of line between Polegate and Heathfield was reopened by the county council as a footpath and cycleway known as the Cuckoo Trail. There are proposals to extend northwards from Heathfield and as part of this extension Heathfield Tunnel has been restored and lit and the 'Millennium Gates' fitted to the south portal.